I noticed this crack the other day when I was putting on my watch. I have never attempted to replace my band and it has never been in any situation where it was struck or dropped. I contacted Motorola and it is being covered by warranty. 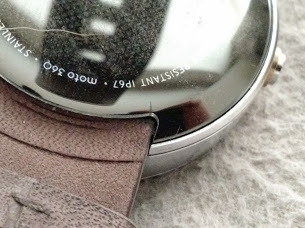 I think the cause is how the opening of the watch where the band attaches and comes in contact with that inside curve. I think they should have just gone straight across. alexisocceromero8, sed51329 and LinkinLake like this. I have heard a lot of people that say that the back of their 360 has been cracked. Definitely seems like a design flaw. Hey, I started seeing this problem as well and decided to get a sharp blade and heated it quite a while so I can make these cuts on the back since it's made of plastic, this was possible. As for why the cracks appear the only reasonable explanation I have is because when you wear the watch, the band presses against the circular part and so it causes tension on that specific part of the watch. I suggest you do this with a little more care since as you can see from mine, I messed up a little on the corner and it ended up with some scratches. its covered under warranty. why would you do that? I love my 360. I figure since it is still under factory warranty for mechanical defects why not get it replaced. I will probably buy the next version they come up with since this one has worked so well for me. I was worried that it being cracked, it wouldn't be as water resistant as expected. I just took a look, at the back side of my 360. And it too, has two hairline cracks on one side of the watch. What, would be the best way, to get a replacement? I bought it from Best Buy, with the protection plan they offer. Or, would it be better to go through Motorola? I do not want a refurbished one, I would prefer a new one if at all possible. Sent from my DROID MAXX!!!! Quick question, did Motorola send you a brand new 360 or was It a refurbished one? Also, what type of information did you have to provide? Thanks! They will send you one that has been reboxed, but have told me for my 2 replacements(and another crack now on this one) that they are new devices, just may have had damaged boxes/open boxes. Comes with all the normal accessories, plus you keep your charger, so you will get an extra. I did the advanced replacement, and will again when I feel like calling for my current cracks. You give a credit card, they put a $200 hold on it, send you a 360 (2nd day), then you mail yours back, hold comes off credit card. Pretty easy. I have had no problems. I initially had to send some pics, but they didn't ask for any for the other ones. It's honestly sad that I will be getting a third replacement. They even sent me the metal band for my current one. It made it 2 months. It's even quite loose on my arm, so not like I put stress on the back. anon(5002059), vegasdroid and monky80 like this. Thank you, that helps me out on what I need to do for my replacement. Did you have to ask them and/or pay for the different band they sent you? I have the gray leather one and I would like to see if they would send me a cognac leather instead. I asked on my first replacement, they said no, to upgrade to the metal band. It was after the second watch cracked in less than a month that they offered the upgrade for me. Since yours is essentially a "lateral" move, they may do it. Never hurts to ask! Also, have your Serial Number handy. Another tip, keep track of your calls. I have read some folks having issues, then getting on the Motorola forums and asking for help. They always want to know the details of the calls, Date/Time, Representative Name, Expectations Set, etc. vegasdroid, anon(5002059) and TruPlaya187 like this. Hopefully the next version will have this solved. Still waiting on my replacement to arrive. Looks like moto didn't do proper FEA on the 360, that or they are having material quality issues. Either way, it is disappointing. I have the "female" band steel 360. Wondering if all the steel 360 are at risk or only the larger bands? Only had my watch a few weeks. So far no cracks. Ugh. I just checked mine and it's also cracked in the same exact location. initiate through live chat window on Moto website. I said I discovered while putting my watch on. I said it looks to be a design flaw because you can see where the band and the bottom of the watch come in contact. Other than that, the band has worn in nicely. kinda bummed I am going to have to "break" the new one in. I am going to pay more attention to the watch this time around. I forgot how stiff the leather was and I can see the stress put on the underside where it comes in contact. Maybe take a pic with date and time on it every time I put it on since people have had to exchange theirs more than once. I still love this watch over the other android options. I might try a metal band. I chatted yesterday, and I'm being sent a replacement. The chat rep, and the customer service rep I talked to were both fantastic. I was really impressed with their support. I have always had good luck with Moto support. When you got sent a replacement, did they try to charge you or make you send the watch back first? Just curious. Yeah. They put a $200 hold on my credit card (lasted about 2 or 3 days before the bank releases it) and they sent me a refurb. I had the option to send them mine first, but I didn't want to be without my watch. If I didn't have the $200 to spare, I would have sent it in though. 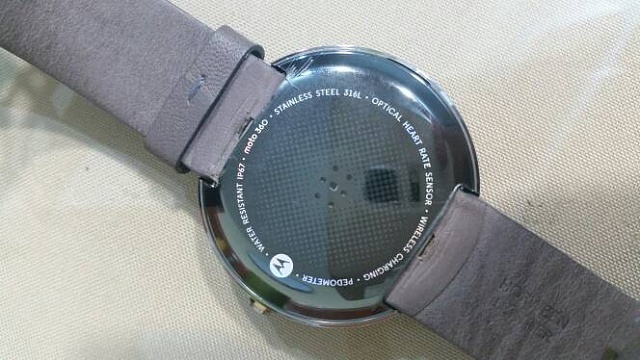 I returned my Moto360 today for replacement because it developed 2 cracks in the back. Can anyone tell me if all my watch faces and apps will restore to the new watch when it connects or will I have do download and install them all again? Yes. It may take a few minutes to an hour for everything to sync. Inspect the back at least once a week. I wore mine for 3 months before the first crack, then the next day it had two! Are you all seeing cracked watches with stock watch bands? Moto/Active Display - time btwn "pulses"
On my Moto X, when making touch calls, why does my screen go black? How do I get back the Lollipop update on my Moto E? How do I see notifications on my fit bit surge from my Moto X?